Fairfax County Police say there is no evidence that an increase in the number of robberies in the Reston area this year is due to the opening of Metro’s Silver Line in Reston 15 months ago. Last week, Capt. Ron Manzo, commander of the Reston District Station, told Reston Association’s Board of Directors that there had been a 100-percent increase in robberies compared to this point in 2014. The number has increased from 16 to 32. Several Reston Now readers commented both on the article and on Reston Now’s Facebook page that Metro must be the reason for the increase. Katy DeFoe, the Reston District Station’s Crime Prevention Specialist, said none of the robberies Capt. 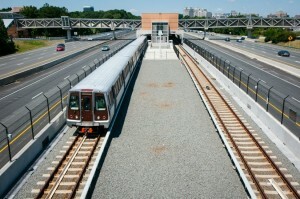 Manzo spoke about happened within a quarter-mile of Wiehle-Reston East. There was a robbery nearby on Roger Bacon Drive on Oct. 24, however. DeFoe says the number of robberies includes nine commercial/bank robberies, including two bank robberies in the last two weeks. Neither bank was in the immediate vicinity of Wiehle-Reston East. Of the 32 robberies, there have been seven arrests. All suspects arrested had a local (Fairfax County) address, said DeFoe. DeFoe credits the rise in the number of robberies to a rise in reporting of crimes. Overall crime is down 3 percent in the Reston District, said DeFoe. Fairfax County Police Chief Ed Roessler told Reston Now in 2014 that combining an increased population with urban-style gathering spots does increase the chances for crime. But it doesn’t mean it has to increase actual crime rates — especially as Wiehle-Reston East stands now, where there is currently little development right at the Metro station.